HotlineX and Pro Analyst are powered by TotalAccessPlus, and Ultra Access, our sourced for intraday, live, streaming market data. 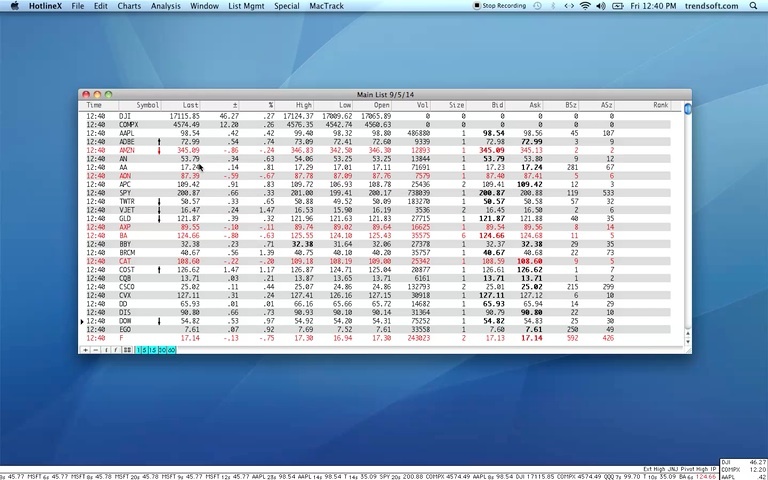 Live Streaming prices on Equities (U.S. and Canadian, Futures, Forex Currencies, & Market Indexes. Live Streaming extended market prices. Streaming delayed quotes on all exchanges not selected for real time. Month-to-month agreement, no annual prepayment required. TotalAccessPlus is a 15 minute delayed feed and is just $35.95 per month including our Pro Analyst software. Real-time service starts at $69 per month. Order Total Access Plus service online. Applicable to both Pro Analyst and HotlineX. On demand access, includes historical data plus end-of-day updates on as many stocks (Australian, Canadian, Indian, London and U.S exchanges), mutual funds (U.S. and Canadian), futures, commodities, Forex currencies and market index symbols as you want. Watch a demonstration video of Total Access, on-demand data service in action. Any of our services may be cancelled at any time without cancelation fees or penalties. Just cancel online, drop us an e-mail or call to let us know and you're done. Even annual plans can be cancelled. We'll subtract what your months of service would have cost on a month-to-month basis, and refund the difference. Total Access is available exclusively to Trendsetter customers. The monthly price includes access to telephone technical support and Free software. Drop us an e-mail or call us at 800-825-1852 to discuss your specific needs. Thousands of individual and institutional investors rely on our data for its industry standard database of daily historical securities prices. We have met the needs of the most demanding traders since 1987, by delivering the most accurate and comprehensive securities data service available. And it's always available. Users can log into their protected mainframe data center 24 hours a day, 365 days a year to retrieve the data they need to make their investment decisions. We are fanatical about the quality of our data. That's why we are the securities database by which all others are judged. Our proprietary database is maintained in Chicago, using direct data feeds from all the world's principal exchanges and reporting authorities. Advanced data integrity procedures ensure that all exchange-broadcast corrections and corporate actions (such as splits) are properly reflected in their database. Finally, all data is cross-checked with institutional reporting services, like the Associated Press, to verify the accuracy of every data item. As a Trendsetter customer, you'll be getting the quality data that Wall Street's top traders demand. The most complete pricing database available. Daily stock data for NYSE, NASDAQ and AMEX, all Canadian exchanges, the ASX and the London stock exchange. Market indices and statistics such as the Dow Jones, Value Line, NYSE Composite, S&P 500/100 and S&P industry group data. Mutual fund data from every family. And, the world's largest database of commodity futures contracts. Click here to download histories in our format. © 2017 Trendsetter Software, Inc.